When it comes to discussing the effects of the Creekside Development Project on the South Umpqua River, essentially we are discussing the positive environmental effects on the South Umpqua River and on Jordan Creek. One way to discuss the positive environmental effects that the project has had is to document the environmental changes that have occurred, and that will occur as a result of the project. The City of Canyonville daily contributed about 300,000 gallons of non- potable water to the river. 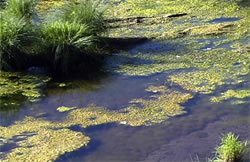 Habitat destructive algae blooms occurred in the river, especially during warm summer months. Due to low fish populations, salmon fishing in the river had been prohibited for several years. Fishing, rafting, boating and swimming activity in the river were minimal. Bird populations, especially raptors such as Osprey and Bald Eagle populations were at a minimal level. Generally, people had oriented their recreational activities away from the river. People living along the river had "turned their backs" on the river, not only as a resource to use, but also as a source of entertainment. New homes built downstream from Canyonville have been built, not on river's edge, but well away from the river, facing away from the river. An environmentally healthy river would have encouraged river-side construction, orienting families toward the river, toward using the river recreationally, as well as productively. Seven Feathers Hotel & Casino Resort grey water is being gravel filtered before entering the river. Hookups in the form of fire hydrants in Canyonville are available for fire and other emergency shortages. In cooperation with the the Department of Fish & Wildlife, the Tribe is raising 43,000 to 45,000 steelhead smolts from Rock Creek Fish Hatchery in acclimation tanks near the river for release into the South Umpqua River. Efforts are underway to re-orient the community toward the river for recreation and interaction. Completion of the redirection of 300,000 gallons per day of non-potable water from Canyonville into the grey water reservoir. Continuation and enhancement of the yearly steelhead smolt acclimation and release program. Continuation of community re-orientation to the South Umpqua River for recreation and interaction.